Garden of Aaron: Help Wanted: Best Quick Privacy Screening Shrubs for Zone 7? Here's the scenario: We moved into our home about two years ago. The development and the surrounding houses are around 6-7 years old, but many folks still seem to prefer huge expanses of grass to any large trees or bushes. 2) Dense. Well, I'm planting these for privacy / screening, so having an airy see-through shrub wouldn't make much sense! :) Evergreen would be ideal, but not necessarily a conifer. And I'm not opposed to having deciduous shrubs in the mix since I spend most time outdoors in warmer weather anyway when the bushes would have leafed out. Also, I know that some shrubs with a dense branching structure can provide some privacy / screening even if they're deciduous. 3) Hot and sunny. Because none of the neighbors have many trees and we're on top of a hill, the backyard is windy, full sun pretty much from morning until night. These plants have to be able to take the heat and they have to be drought-tolerant -- both on general principal and because I don't know how often I can lug a hose to the edges of the property. Oh and they have to be able to handle clay soil and wet winter conditions. Is that asking too much? 4) Not too big. I don't want to be a jerk and put plants on the perimeter of the property that tower over the neighbors' yards. I think my ideal shrub would be the 8-10 feet range. I wouldn't mind something that topped out a bit taller (12-15 feet?) or could be kept in the desired range by being trimmed once a year. And of course I'm not going to plant it right on the property line, but well within our property so that the mature plant should not hang over into the neighbors' space. 5) Safe. Several of our neighbors have small children, ergo I would not want to plant anything that's even mildly toxic. A surprising number of common landscape plants are poisonous (for instance, yew, daphne, wisteria, azalea, etc.) I was excited at the notion of using a native holly like Ilex opaca or the Ilex attenuata hybrid, but some sources like NCSU list the berries as being slightly toxic. Even though the USDA calls I. opaca non-toxic, I'd rather err on the side of caution and not put such a plant near the edges of my property. 6) Climate suitable. We're on the cold side of zone 7. (We were in the warm part of zone 6 until the latest USDA zone refresh.) Temps regularly fall into the high teens in the winter. Summertime highs often hit the 90s and sometimes even climb into triple digits. Average annual rainfall is around 47-inches. Average annual snowfall is supposedly 10-inches, but in the few years we've been here, snow has been exceedingly rare. Ice is a more likely (and more frightening) possibility. Raphiolepsis umbellata, Indian Hawthorn, not sure which variety, but definitely a variety that grows too low to provide any privacy screen! 1) Raphiolepsis umbellata, Indian hawthorn: We have several of these as foundation plants and they have been carefree and bulletproof since we moved in. They're not terribly flashy, but they do have nice pink flowers for a brief time in the spring. They're evergreen and supposedly prefer partial or full sun, although again ours seem to be thriving in a mostly shady area underneath a large crape myrtle. (I guess they get a lot of afternoon sun in winter and early spring when the crape has dropped its leaves, but they're mostly in shade the rest of the year.) Supposedly they're able to handle heat, humidity, wind, drought and rabbits. A nearby nursery carries a variety called Southern Moon that supposedly can grow 5-6 feet tall and 6-8 feet wide. The thing that gives me pause is that the varieties we already have are very low shrubs (maybe 2-feet tall by 5-feet wide). I don't know if they usually grow wide before they grow tall or if Southern Moon would have a more upright growth habit. I believe they are also supposed to have a slow growth rate. There's another variety that intrigues me called Montic (a.k.a. Majestic Beauty) that I've seen described as everything from a 5-foot tall shrub to a 25-foot tall tree. Sounds very variable! 2) Vitex agnus-castus, chaste tree, monk's pepper - It's the right height -- supposedly grows up to 25-feet tall in zone 8 or 9, but I've read that it would probably stay closer to 8-10 feet tall in Tennessee. Based on my experience so far, it definitely seems able to tolerate heat, rain, wind, full sun and flying bowling balls. (OK, probably not that last one...) The flower are bee magnets, which I love. In my experience, it has a decent growth rate. The only real drawback I can see is that it is deciduous and leafs out as late as the crape myrtle (mid-April). 3) Lagerstroemia india, crape myrtle - Speaking of the crape myrtle...I know from 2012 that these are tough as nails and can handle punishing heat and drought (at least once established). They also grow fairly quickly (1-2 feet per year or more) once they've settled in. And there are some nice-sounding varieties like Catawba that are available at local nurseries and reportedly mature around 12-15 feet tall. The flowers seem intermittently attractive to bees (they were all over the flowers on the Natchez Crape when they first opened, less so now). Of course, as I just mentioned with the Vitex, crape myrtles are deciduous and take a looooong time to leaf out in the spring. So, not a lot of privacy in winter. They're also ubiquitous (for good reason) in the landscape around the neighborhood. Personally, I have about 10 of the plants on my property, so I'd prefer to add something different for the sake of biodiversity. The final kicker is that none of the three young crapes I added from a local nursery last winter have grown at all. Two are looking fine and one (that gets blasted with wind at the corner of the house) looks a bit ragged. None show any inclination to bloom. So my experience leads me to believe that small crapes probably need some time to settle in before they grow and bloom. Of course, I could start out with larger plants...but still, crapes are not at the top of my list. 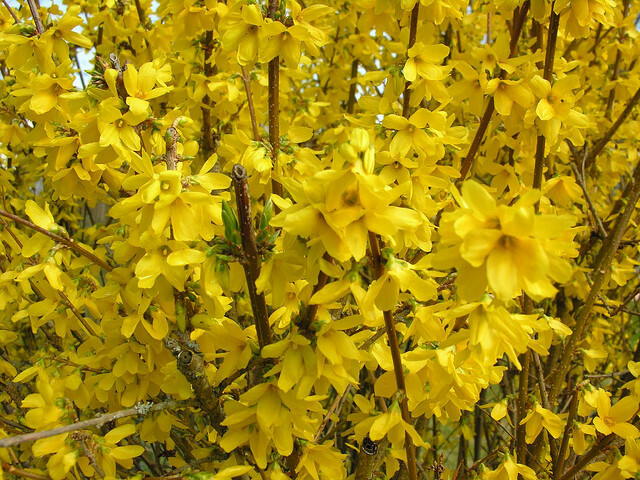 4) Forsythia x intermedia 'Lynwood Gold': Yes, they're also sort of ubiquitous, but they do add a cheery yellow start to spring and supposedly provide a good early nectar source for bees. More importantly, they are reportedly very tough, rugged and drought-tolerant. Lynwood Gold supposedly can grow as fast as 2-4 feet per year and tops out around 8 feet tall and 10-feet wide. And it's available at a local nursery. 6) Myrica cerifera, southern waxmyrtle: It's a native evergreen shrub that reportedly tolerates heat, drought, wind and full sun. It supposedly has a rapid growth rate and matures anywhere from 10-30 feet tall (so I might have to do some pruning to keep it at the desired height). The flowers reportedly attract butterflies and the berries (if both male and female plants are present) reportedly attract birds. In terms of drawbacks, we're at the northern end of its range, so I anticipate there could be some damage in tough winters, but southern waxmyrtle can reportedly bounce back quickly from winter damage during the warmer seasons. 7) Osmanthus americanus, Devilwood, American Olive: A native evergreen shrub or small tree (reported height typically ranges from 10-20 feet tall, but can reach 50-feet in extraordinary circumstances), Devilwood is supposed to be fast-growing (1-3 feet per year), and tolerant of wind, drought, flooding and full sun. 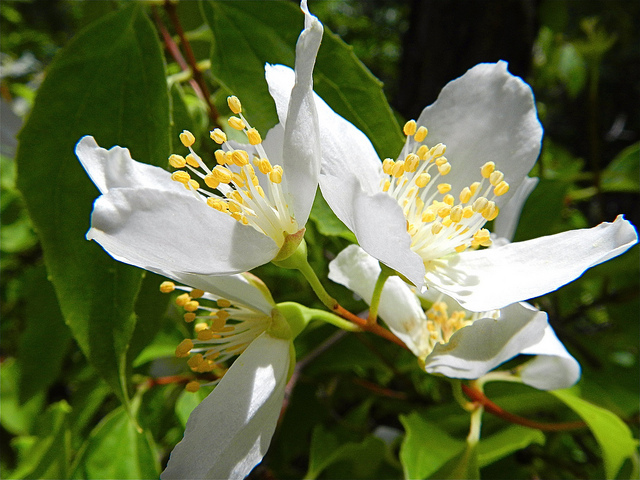 8) Philadelphus lewisii, Lewis' Mock Orange: A native of the Western U.S., Lewis' Mock Orange height varies by cultivar, but the Natchez variety carried at a local nursery reportedly grows 6-8 feet tall and wide. It is reportedly wind-tolerant and drought-tolerant. The flowers are supposed to be fragrant. The shrub is deciduous and some sources recommend using rejuvenating pruning techniques (cutting the plant to the ground after flowering -- though I'm not sure if this is supposed to be an annual process), so I'm not sure whether it would make a good screen in that regard. 9) Ternstroemia gymnanthera, Cleyera: An evergreen shrub that can grow 8-25 feet tall. I have a few concerns: (1) Reportedly prefers acidic soil whereas I think our soil is relatively neutral (although I could amend at planting and with some acidic fertilizer yearly thereafter, (2) contradictory information as to whether it requires partial shade or can handle full sun and (3) reportedly only has a moderate growth rate. To add one more layer of confusion and uncertainty, even though Ternstroemia gymnanthera's common name is "Cleyera" and even though Ternstroemia comes from Japan, this plant is apparently not the same as Cleyera japonica, which is also called Cleyera. Confused yet? Me too. Well dang! I read through this entire thing thinking "that's exactly what I'm looking for!" And looking forward to the responses at the end but there are none :-( Your post was very informative and helpful though so I'm off to read up on all of your suggestions! Thank you! 1) Indian Hawthorn - The ones we had were burned by the winter of 2013-14, so I ripped them out. Obviously I did not purchase new ones for a privacy screen. I think this could be a good option in warmer zones (say zone 8 or warmer), but I understand it's very overplanted in those areas. 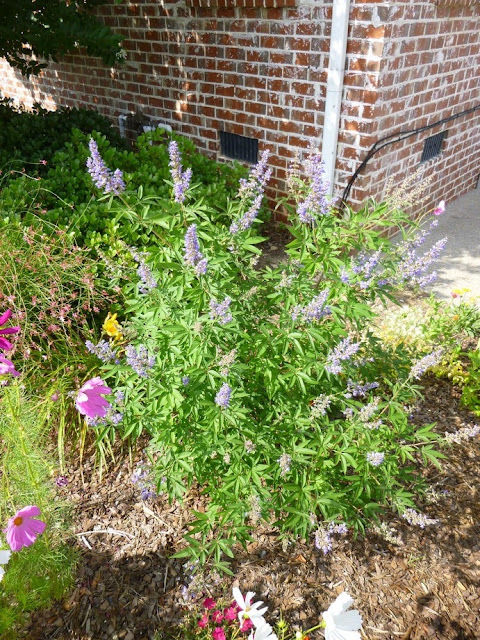 2) Vitex agnus-castus - Still loving it. Did great last year. Only caveat is that it's both deciduous and late to leaf out. Right now (April 1, 2015) it's still totally bare. So you'd have to deal with at least 4-5 months when the deciduous nature of the tree would reduce its utility as a privacy screen. 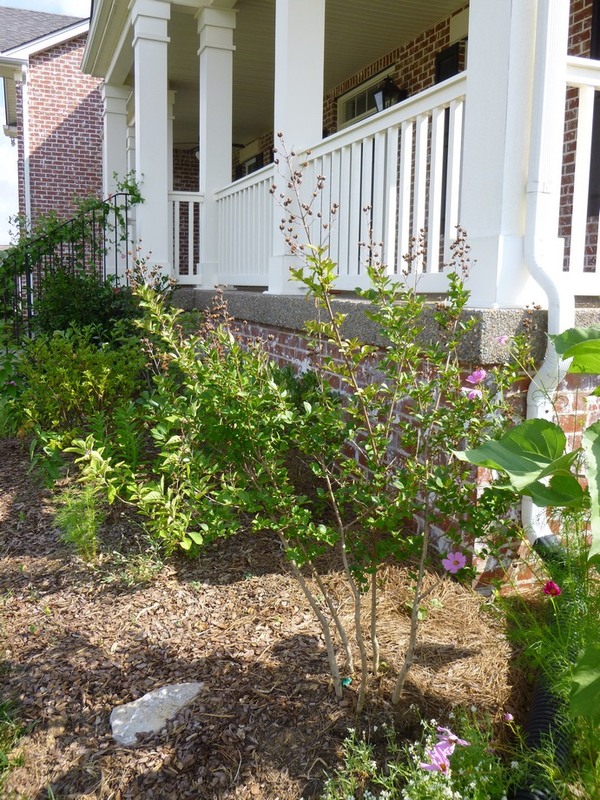 3) Crape myrtle - It's totally overplanted in Middle TN (and warmer zones). Many of the flowers are nauseatingly garish (IMHO). I do really like the white ones such as Natchez, which also seem to have the greatest appeal to bees. You can't knock the loooooooooong summer bloom season, but same problem as with the Vitex if we're talking about a privacy screen - it's going to be deciduous and bare for 4-5 months in zone 6b/7a. None of mine have leafed out at all yet this year. I'm guessing it'll be a couple more weeks before I start to leaves and they probably won't leaf out fully until late April or early May. 4) Forsythia - Boring, overplanted, minimal wildlife value, but ubiquitous for a reason - tough as nails. So I broke down and planted one last fall. Minimal bloom this spring (I mean *really* minimal - like 2 flowers) but it's leafing out nicely and I kind of love the bright green foliage. Time will tell. I'm reserving judgment for now. 5) Magnolia grandiflora - Haven't used any yet, but planning on adding three compact ones to the front yard this spring. 7) Osmanthus americanus -- I planted one last autumn. Deer (presumably) chomped it to bits. It looks like it's trying to releaf. I don't have high hopes, but I'm trying to keep an open mind and reserving judgment for now. 8) Mock orange - Planted one in autumn 2013. It did great last spring - beautiful bloom! () - but didn't grow one lick. Still, I think it was just getting established. (I'd bought it off a sale section and it was looking pretty pitiful at first.) I have high hopes this will turn out OK. But again, it's a deciduous shrub and even if it leafs out a few weeks earlier than plants like vitex and crape myrtle, it's still probably a poor choice for a year-round privacy screen. 9) Cleyera - I'm still confused by this one. Haven't tried it. I think it's probably for zone 8+, but maybe would do OK in a sheltered location in colder zones? 10) Viburnums - I've tried V. dentatum and I like it, but I'd make the same general comment as with the mock orange, vitex, crape myrtle, etc. -- it's a deciduous shrub, and therefore unlikely to provide great winter screening. I do think that arrowwood viburnum might provide a bit more screening than these others since it seems likely to send up so many stems and suckers, and also because the old leaves seem to hang on the shrub a bit longer. A couple of leaves even hung onto my young plant all winter. Perhaps older and more established plants with denser foliage would retain more leaves? The only other Viburnum I've tried from my original list is V. x pragense. My impression? Meh. I've been counseled to give it more time, but one looked so awful last year that I had to rip it out (and replace it with the forsythia). I've left the other four for now, but I think their days are probably number. It's definitely semi-evergreen or evergreen in zone 6/7, but it doesn't exactly look pretty over the winter and I just don't much care for the way it looks aesthetically. Perhaps I'll change my tune once it starts to bloom and I can see whether it attracts any pollinators. - Juniperus virginiana, eastern red cedar -- Over the past couple of years, I've had 10 eastern red cedars installed on my property and they have all thrived while numerous other plants have failed to cope with our temperature extremes (zero in winter, 110+ in summer), heavy clay soil, summer droughts and spring downpours. Personally I really like the way they look - especially the Burkii, Brodie and Grey Owl cultivars. (Grey Owl is more of a low-growing shrub, but Burkii and Brodie are upright growers.) It's totally evergreen, has berries (actually small cones) for the birds and generally seems like a great plant. I wish more people would plant them rather than exotic trees like Leyland cypress or Chinese juniper. The Clara Indian Hawthorne will withstand drought, freezes, etc. The variety of Indian Hawthorne is key. You get get very sparse, hardly there bushes that perish if you blink. The Clara's seem to be very hardy. I apologize that I do not have the time right now to look it up for you but please check the different varieties and you will be very happy. No pruning if you just want a beautifully mounding 3 ft bush. I've no doubt that 'Clara' is a tough shrub -- but I don't think it's a good choice for Middle Tennessee or anyplace else at the colder side of Zone 7. I am in a similar situation, but have acidic soil. The only plant in your list that I won't use is the southern magnolia, even the Little Gem. These trees are very slow growing and drop lots of trash (BUT if I were Samantha, I'd twitch my nose and zap a 25 footer spang in the middle of my barest spot, and to heck with the trashy stuff)! I did plant a magnolia virginius- the native smaller-leaved tree. If we hadn't had so much snow, wind, and ice this year, I think it would have been fine. Time will tell. I also planted a magnolia stellata which has white puffy blooms before leaves. Gorgeous blooms and a rounded shape, medium growth. I am going to get several of the plants you suggested- vitex, snowball viburnum and burkwoodi, maybe the devilwood. Thanks for the "legwork"- most informative and helpful. I'll report back later! I'm thinking about adding a few southern magnolias this spring. Hope I don't regret it! I agree that the little ones sometimes don't look that great, but I'm hoping my landscaper will find me a few bushy, dense specimens. I've considered the Magnolia virginiana (sweetbay magnolia). I understand that most varieties are only semi-evergreen or deciduous in our area (Middle TN, zone 6-7). Some varieties might be evergreen, but I suspect they'd have some damage to their leaves in a typical winter here. Also, the foliage generally does not seem especially dense, though often I see them planted along a house where they are in partial shade. Perhaps they'd do better in full sun? I saw some of the star magnolias blooming at our local botanic garden a week or so ago. Looked beautiful (and smelled nice too)! I presume those flowers would be damaged by late frosts/freezes though? I know that my neighbor's saucer magnolia had all its flowers fried a few nights ago. I live in zone 7 south Carolina, since I live practically on highway, have to find something tough, the only thing I can get to grow is pampas grass, zebra grass etc. thinking about clumping bamboo. I'd encourage you to try to find something native with some wildlife value that can still serve your purpose. Maybe Juniperus virginiana (eastern red cedar) or Myrica cerifera (wax myrtle)? It's my understanding that many of the clumping bamboos cannot tolerate zone 7 cold temperatures. Those that are cold tolerant (see http://www.bamboogarden.com/Hardy%20clumping.htm) generally are not supposed to like theat and humidity of the Deep South (they're better in places like the Pacific Northwest). There is a native U.S. bamboo like plant - giant cane (Arundo donax), but I believe it's a runner, not a clumper. If it has to be evergreen, you have options like hollies (e.g., Ilex opaca), Osmanthus heterophyllus, Prunus caroliniana, etc. If it can be deciduous, well you have a lot more options! Thanks for your comment, Loretta. Happy to hear that the chaste tree (Vitex agnus-castus) is growing well for you, but as you say, it is deciduous and so does not help with providing privacy/screening in winter. Although I notice you're also looking at dwarf ninebark. I have to admit I'm a little confused. Are you looking just for a low-growing hedge? Most people who want privacy screens want something that will grow a bit taller than 3 or 4 feet. I think you'll be very happy with the eastern red cedar. If you're looking for a low-growing cultivar, Grey Owl is my favorite. The two upright cultivars I've tried (both growing well so far) are Brodie (narrow, dark green) and Burkii (more pyramidal with silvery-blue foliage). And of course eastern red cedar is a native tree that will help support wildlife (birds) with its cones/berries! 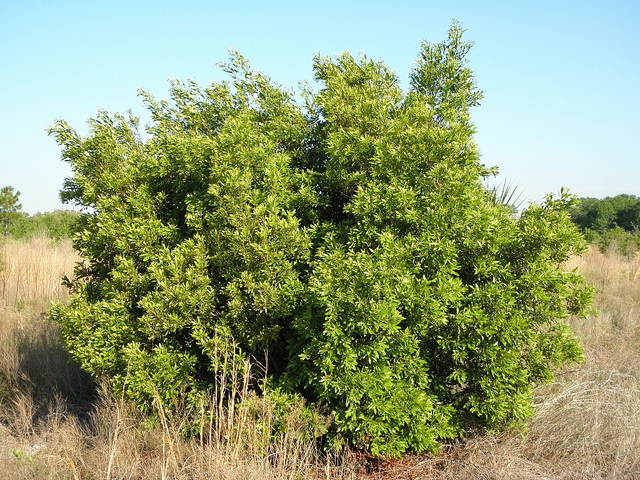 Have you thought about trying wax myrtle (Morella cerifera). I added two 1 gallon plants to my garden last autumn. I probably should have planted them in spring, because I think they are only borderline hardy here. Despite our harsh winter (and some deer damage), they both survived and are leafing out nicely now. I understand it's supposed to be very fast growing and provide good privacy. I think it would be fairly evergreen (or at least semi-evergreen) in your area. PS - One other thing I should mention (although it may not be a concern for you) - both Juniperus virginiana (eastern red cedar) and Morella cerifera (wax myrtle) are known for having a high concentration of oils, which I believe is supposed to make them highly flammable. For that reason, some experts advise against planting either of these plants near to your house, especially if you live in an area prone to wildfires. this is my third try to post, so forgive if repetitive. Euonymous "Manhattan" just earned a spot in the NC zone clay in my yard. Evergreen, 8 ft mature, fairly dense and fast growing. Might work for you. Sorry you had so much trouble posting, hwb. Very interested in your post as emigrating from uk to md (zone 7) and want privacy, after researching I will plant eunonymus japonica(variegated), elaeangus macrophylla,and your native laurel. These will all be hardy and I should soon have a 6-8ft screen with a mix of evergreen leaf colour. By native laurel, do you mean the Carolina cherry-laurel (Prunus caroliniana)? 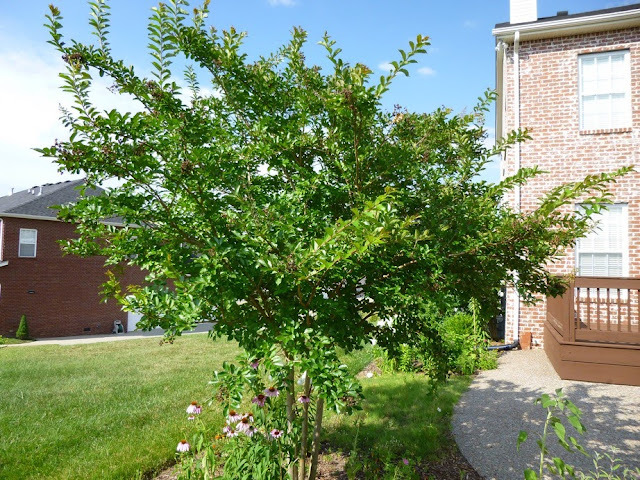 It's not actually native to Maryland (only as far north as North Carolina - http://bonap.net/MapGallery/County/Prunus%20caroliniana.png), but I think it would be worth giving it a try for privacy. It can get much larger than 6-8 feet tall without pruning, but I think it's very amenable to being pruned. Do be aware that the foliage, twigs and seeds are all very toxic (as with many plants in the Prunus genus). I doubt you'd nibble on the plant, but if you have children and/or pets it's good to be aware. I know that at least some species of Elaeagnus are very invasive in the U.S. (see http://www.nature.org/ourinitiatives/regions/northamerica/unitedstates/indiana/journeywithnature/autumn-olive.xml for example). Not sure about E. macrophylla. I would advise checking with the local agricultural Extension agent or botanic garden near your home in Maryland before planting -- just to make sure you don't add anything to your garden that could spread to wild areas (via birds distributing the seeds) and then disrupt local ecosystems. If you can live with some deciduous plants as part of your mixed hedge, I'd strongly suggest looking at Viburnum dentatum (arrowwood viburnum), another native (http://bonap.net/MapGallery/County/Viburnum%20dentatum.png) that has flowers for pollinators in the spring and blue berries for birds in autumn. I have three growing in different exposures ranging from full sun to partial shade and they have all done very well for me. Another interesting option could be Magnolia virginiana (sweetbay magnolia), which has fragrant summer flowers and is also native to your area (http://bonap.net/MapGallery/County/Magnolia%20virginiana.png). 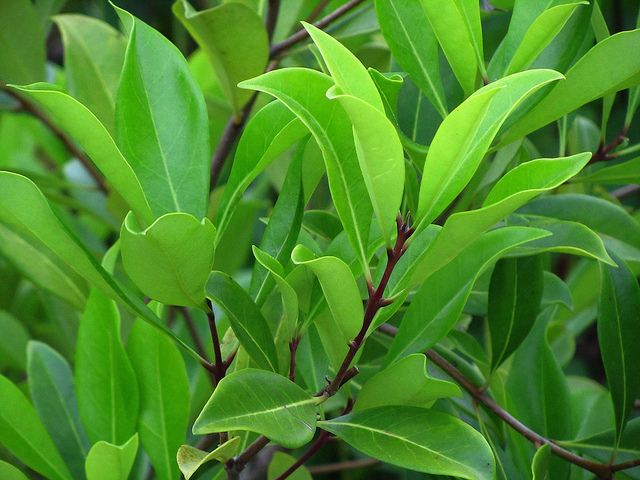 Many sweetbay magnolis are only semi-evergreen or tardily deciduous, but there is a variety called 'australis' that reportedly acts as an evergreen. I am allowed to bring 12 barerooted planted with phytosanitary cert. from UK, want winter colour and screening. Will bring eunonymus japonica variegated, elaeangus ebbingii and macrophylla(variegated), golden privit and variegated english laurel,as none of these are available in usa except for the privit possibley. We have a fantastic selection of all plants at prices a fraction of yours but not the mountain laurel (calico bush) which I've read is native to Eastern US , luckily I've located an online wildflower nursery which has them for $12 so I will buy these over there. Here in UK I have several tracycarpeus fortunei and they give my garden a year-round tropical effect, I am wondering if these palms will grow in zone 7 as they are native to China? According to reviewers at Dave's Garden (http://davesgarden.com/guides/pf/go/2255/), Trachycarpus fortunei (the windmill palm) might be able to grow in zone 7, but there is a Maryland gardener who says his/her windmill palms all died in the (unusually harsh) winters of 2013-14 and 2014-15. That same Maryland gardener recommends these other palms as alternatives for Maryland gardeners: "For those interested in growing palms in cold areas, here is a list of the survivor palms that proved to be hardier than windmills for me in this area: Rhapidophyllum Hystrix (needle palm), Sabal Minor (dwarf palmetto), Sabal Louisiana (louisiana palmetto), Sabal Brazoria (brazoria palmetto), Sabal Palmetto (cabbage palmetto), Chamaerops Humilis (Mediterranean Fan Palm) Serenoa Repens (saw palmetto) and (Chamaedorea Radicalis, which was buried in mulch)." You mentioned golden privet, but I think that's deciduous (http://www.monrovia.com/plant-catalog/plants/1795/vicary-golden-privet/). Down here in TN, I believe English laurels are susceptible to disfiguration from something called shothole fungus. Fungal diseases are difficult to control in the landscape even if you are OK with spraying your garden frequently (which I would discourage). 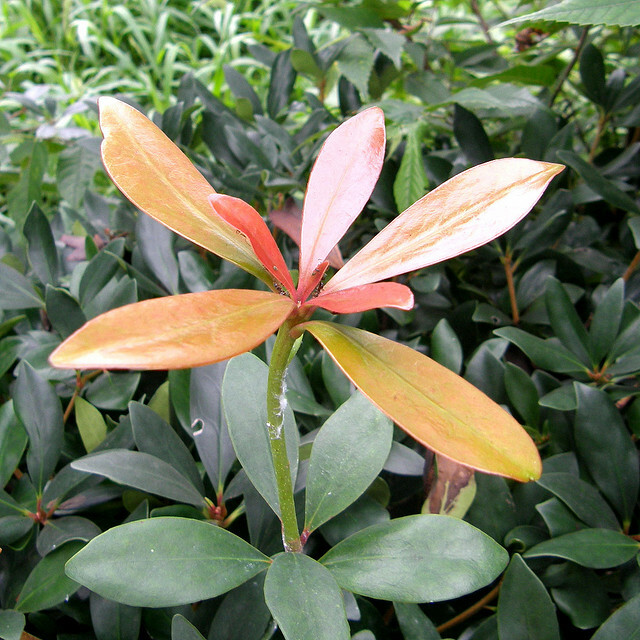 You may want to check with a local extension agent in Maryland to see whether shothole is a problem on English laurels there too (http://pnwhandbooks.org/plantdisease/prunus-laurocerasus-leaf-spots-and-shothole). If you have shade, one option for colorful evergreen foliage could be Aucuba japonica 'Goldstrike' (http://www.monrovia.com/plant-catalog/plants/129/mr-goldstrike-aucuba/). They're lovely plants IMHO, non-invasive (as far as I know) and hardy to zone 6. They do need some shade though I think to prevent the foliage from burning. As for elaeagnus x ebbingii, it sounds at least mildly invasive in the Southeast (http://www4.ncsu.edu/~jcneal/Website/Assessment_results/thorny_elaeagnus.pdf), ergo personally I would discourage you from planting it. Thanks for the suggeston, anon! I believe L. henryi is native to the Caucasus and Far East. Nowadays (more so than when I wrote this post), I'm trying to focus on natives - either native to this part of Tennessee or at least native to the Southeastern U.S. I emphasize natives both because I think they tend to play a more supportive and integrated role in the ecosystem and also because I don't worry so much about wreaking havoc by unleashing an exotic invasive into the wild. I don't think L. henryi has as much of an invasive reputation as some other exotic honeysuckles (see, for instance, http://mdc.mo.gov/your-property/problem-plants-and-animals/invasive-plants/bush-honeysuckles-control), but sometimes exotic shrubs don't become obviously invasive until many years after they're first introduced to a new area. And I have read some reports on the Internet of L. henryi behaving at least somewhat invasively in Switzerland and Germany. WOOD BEE problem! I don't know exactly what kind of Euonymous I was given by a neighbor but it was a favorite flower for wood bees. The evergreen variety I had had clumped strings of hanging little white flowers like lily of the valley. If you check, you'll find that wood bees are nearly impossible to get rid of and damage every wood except treated. They come back every year. Don't plant this. Hi there. Thanks for your comment! It sounds like you are talking about the insects that I know as 'carpenter bees'. According to various sources (e.g., Texas A&M), carpenter bees are native to much of the U.S. and are excellent pollinators for many flowers - including garden crops such as tomatoes, eggplants, etc. In short, I think carpenter bees are great! I don't think they cause much damage to wood around the home, and what damage they do cause can be avoided/prevented by painting or coating susceptible wood. Of course, if you have a wood shingle home, YMMV. I used to have some Euonymous (here when we bought the house, so not sure what species) and don't recall the shrubs attracting many carpenter bees. I seem to remember that they did attract lots of flies and small bees. The main reason I'd discourage people from planting some Euonymous species, is that they might be exotic invasives, depending on where you live and exactly which species you're considering. The red cedars are a great choice, but you may want to try the Hiwassee cultivar of wax myrtle developed by the University of Tennessee which is hardy to -5 F. Since it's a nitrogen fixer, it would be good for nearby plants as well. It is available at several nurseries in Knoxville, such as Beaver Creek and in Nashville, such as GroWild. For another choice, although it's not native, but it is evergreen with a nice fragrance in fall, you could try Fortune's osmanthus (Osmanthus X fortunei). The leaves aren't quite as sharp as some hollies or Osmanthus heterophyllus (one of it's parents). But they may still be too sharp for young kids, at least until it grows up and the leaves become more rounded, more like it's other parent, the tea olive (Osmanthus fragrans). It may become a little too tall (~20 feet), but can be trimmed to be maintained at a reasonable height. Thanks for the suggestion! Actually, I planted two wax myrtles in the winter of 2014-15. Straight species, not Hiawassee. One of them didn't make it (combo of cold and deer, I think), but the other one survived and now already has grown about 6 feet tall in just about a year and a half! It's pretty bushy too. So I added another species wax myrtle nearby. I know I need both male and female myrtles to get berries for the birds. I may try to get over to GroWild to get that especially cold-hardy Hiawassee cultivar that you suggest. As for Osmanthus, I added Osmanthus heterophyllus to the garden last winter - the Goshiki cultivar. It seems like a beautiful and tough plant, but pretty slow-growing. I'm not really using them for privacy shrubs - one's a foundation plant, the other is part of a mixed bed on a hillside. I think they would eventually make great privacy plants, but probably not for 5-10 years. For some reason, I thought O. x fortunei was not reliably hardy here in Middle TN? Do you have experience growing it in zone 6 or 7? I also have the native Osmanthus (O. americanus - devilwood). It got attacked repeatedly by deer over the past few years and has survived, but hasn't grown much at all. It's also not evergreen (or rather, I think it's evergreen further south, but not here in the Nashville area). I'm also experimenting with sweetbay magnolia, which again is one of those trees that I think would be fully evergreen further south, but probably will be tardily deciduous and bare for a few months of the year. I think I could live with that and like the fact it's native. I've added two of them to the garden in the past year. They seem to be growing fairly well, but are both still pretty little. Oh and I've also added a species Yaupon holly. Also still quite petite at this stage. My garden is on a windy hilltop, but if I had any sheltered spots, and if I could find it locally, I'd be open to trying one of the O. x fortunei cultivars you suggest. I have not had much luck trying to push zones with some other borderline hardy exotic evergreens (camellias, sarcococca, gardenias, etc.) and at this point I'm leaning more toward native plants in general, but the prospect of an evergreen shrub with winter fragrance certainly is tempting! I live in Johnson City, TN and am thinking about trying Florida leucothoe (Agarista populifolia or Anise shrubs (Illicium floridanum or Illicium parviflorum) as native evergreen shrubs or Titi (Cyrilla racemiflora) as a semi-evergreen shrub in addition to the evergreen wax myrtle 'Hiawassee'. But I'm also on a hill so have cold winter wind issues, but at least some of the cold air flows down the hill. The Illiciums are interesting native Southeastern plants. I think my neighbor grows one of the yellow-leaved cultivars. Dave's Garden makes it sound like the I. floridanum is more adaptable to wet or dry soil. Again, I believe both species are toxic. And I think both are only rated for zone 7, so you'd be taking a risk on hardiness, but I do think they look like beautiful evergreens. Titi is quite an interesting choice. I've seen it recommended for acidic moist-to-wet soils, but I've also heard it can be drought tolerant. I know the flowers are supposed to be attractive to (native?) bees, but I've heard they can be toxic to honeybees (which are non-native). I think the Hiawassee wax myrtle sounds like a great choice. The only issue I've had with my wax myrtle has been bag worms - I saw perhaps a couple dozen, picked them off, sprayed some Bt and have only seen one or two since. Not trying to discourage you from trying any of the others. Like I said, they're all interesting and creative choices. No plant is perfect (at least, it's rare to find one that doesn't have some drawbacks). If you try the ones you've mentioned, I'd certainly be interested to hear how they perform for you in Johnson City! Burkwood Viburnum (V. x burkwoodii): Burkwood viburnum is semi-evergreen, 8 to 10 feet tall and wide, with glossy dark green leaves that turn dark red in winter. Spicily fragrant. 2 to 3-inch flower clusters followed by red to black fruit in July to August. 'Chenaultii' has a finer texture and habit, and is later-blooming than the species. 'Mohawk' has red buds, which are showy long before they expand into white spicy-fragrant flowers. Fall color is bright orange to red purple. Grows 7 to 8 feet tall. 'Anne Russell' has fragrant pink buds and red fall foliage. 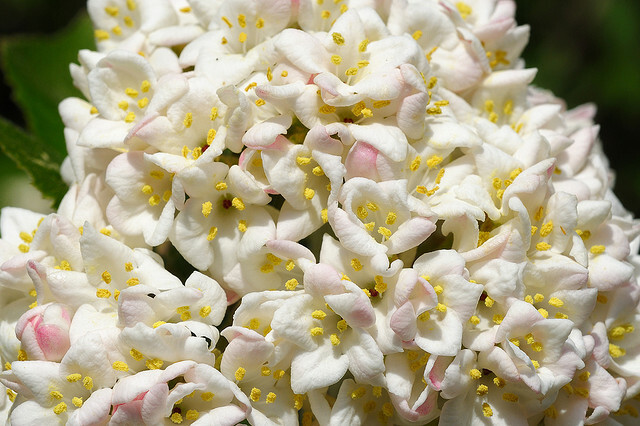 Japanese Viburnum (V. japonicum): Plants are evergreen and grow 6 to 8 feet tall and wide. Habit is dense and rounded, with leathery, glossy green leaves. Good screening plant. Flowers are fragrant and white; berries are red. Part shade to shade. 'Chippewa' has glossy foliage and maroon to bright red fall color. Oblong fruit are dark red. 'Huron' has leathery matte foliage and rich red-purple fall color. Service Viburnum (V. utile): This viburnum is not often grown as a species but has produced some excellent hybrids. They grow best with moist but well-drained soil and some shade. 'Chesapeake' is semi-evergreen, 6 feet tall and 10 feet wide with wavy-edged, leathery dark green leaves. Small white flowers open in April. 'Conoy' is a dense, evergreen with a spreading form to 5 feet tall and 8 feet wide. Pink buds open to white flowers in April. Leaves often turn purple in winter. 'Eskimo' is semi-evergreen. It has a dense, compact form, growing 8 to 10 feet tall and wide. The flowers are pure white, in 3-to 4-inch round snowball type clusters. I forgot to mention that some of my favorite evergreen/semi-evergreen viburnum for a tall hedge are native Walter's viburnum and Awabuki viburnum, which may only be frost hardy to 5 degrees F. New smaller evergreen viburnums with fragrant flowers include Nantucket viburnum and Pearlific viburnum. So many good ones to choose from. However, I prefer the natives, although they lack the nice fregrance of the exotics. Thanks for all the suggestions, anon! I think I prefer native viburnums as well. I've had good luck so far with Viburnum dentatum (including var. deamii and var. scabrellum) from Classic Viburnums nursery. The dentatums are not evergreen though, which means they don't really provide any screening in winter months. That seems to be their only drawback so far. Otherwise, they seem able to thrive in sun or partial shade, tolerate awful clay soil/drought/flooding/etc. while providing flowers for pollinators and berries for birds. As for the non-natives, I currently grow Prague, which is basically evergreen, and Allegheny, which I'd call semi-evergreen. They both offer decent screening value and the Prague in particular seems hella tough. (It was touch-and-go for the first year or so, but I think there were some issues with the planting/installation, which I did not do myself. Once they settled in, they've been rocking and rolling ever since.) Allegheny seems pretty happy in partial shade, but it could not cope with full sun/drought/clay soil combo in Tennessee (although again, I suppose that could have been a planting problem). I did try the native Walter's. I was not a huge fan. It was certainly tough, but the tiny leaves offered minimal screening value or ornamental interest to me. Perhaps I was just impatient? I would guess that over time, with proper pruning, I could have fashioned a much denser shrub. I know there are several gorgeous Asian viburnums, but I'm just more into the natives these days I guess. Sense of place and all that. I'm trying to stay native and bird and pollinator-friendly myself in my small Johnson City, TN yard. I just ordered Viburnum dentatum var scabrellum (self-fertile) and Viburnum nudum 'Pink Beauty' (self-fertile) from Classic Viburnums to complement my Viburnum nudum 'Brandywine' (self-fertile) and dentatum 'Autumn Jazz' (needs a pollinator for berries) and 'Blue Muffin' (needs a pollinator for berries). I'm hoping the latter two V. dentatums flower at the same time to cross-pollinate to get berries, but there is conflicting information online. I was hoping to get Viburnum Bracteatum 'Emerald Luster' (self-fertile) as well, but Classic Viburnums is currently out of stock. I can't wait for the temperature to cool down so they can ship the plants to me. Until then I will likely go to Knoxville to get some 'Hiawassee' wax myrtles. I think 'Hiawassee' may be a male clone, although one source told me it can have both male and female flowers, which I'm a little skeptical of :). So I'm hoping to find another Myrica that it will pollinate that doesn't suffer winter leaf burn in zone 6B/7A. 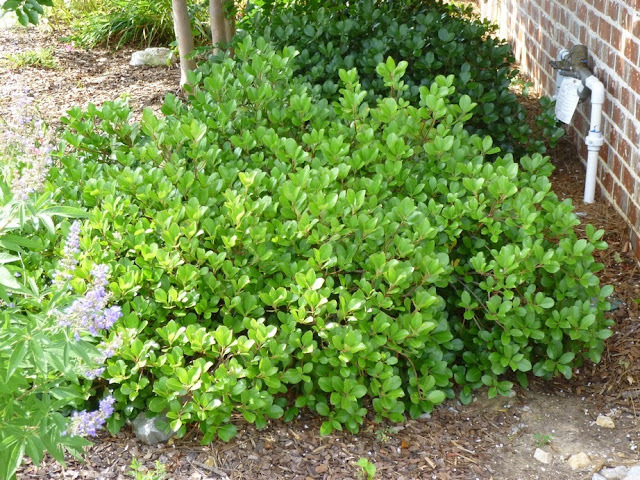 I'm thinking about ordering several Myrica Heterophylla (Morella Caroliniensis-evergreen or swamp bayberry) online as I can't find it locally in east Tennessee. But I doubt they will have the same flowering time as the 'Hiawassee' wax myrtle for cross pollination. I may just have to settle for leaf burn if I want wax myrtle berries for the birds. I'm not even sure that the birds that eat the wax myrtle berries will come visit the east Tennessee Appalachian foothills (elevation 1,500 feet), but maybe the birds that eat northern bayberry will come and enjoy the slight change of diet. I really hope the Myricas keep the mosquitoes away from my yard. Maybe planting elderberry will also help. I almost broke down and ordered the Viburnum 'all that glitters' and Viburnum 'all that glows' online. But I couldn't tell from the online description if they were V. dentatum var deamii or V. bracteatum. They are likely one of each for cross-pollination. Now I'm facing space limitations so I'll have to start getting smaller, self-fertile, or monoecious shrubs to get berries to attract birds and save space as well. So I've thus far avoided native dioecious hollies. But I'm tempted to get the compact form of inkberry holly (Ilex glabra), as that is probably the best native evergreen small hedge for berries. Do you know if the related larger species Ilex coriacea- large gallberry is hardy in zone 6B/7A? The sources I've found state zones 7-9, so I bet it's borderline like wax myrtle. Best of luck with the native plants! Thanks for your lengthy and fascinating comment. It certainly sounds like you've done your research! I'll be interested to hear how you like var. scabrellum. Personally, I think I prefer the larger leaves of the 'regular' arrowwood viburnums, but your mileage may vary. Autumn Jazz seems like a real keeper so far (though it's only been in the ground less than a year at this pont). I don't grow any of the Viburnum nudum cultivars yet. I've read they prefer moist soil, but I do hear they're pretty tough and clay tolerant, so I'll probably try one and hope I can build up its drought tolerance over time. Good luck with the wax myrtles! I have a regular (straight species) one that has done fine for me so far and withstood some near-zero temps its first winter in the garden. But I do believe you're quite a bit colder in the winter up in Johnson City? Honestly, I've had rather poor luck with Ilex glabra. And the ones I've seen planted around our neighborhood rarely look good. They seem to get stressed and lose a lot of their bottom foliage. They're also very slow growers (which could work for you if you're looking for a dwarf shrub). From Missouri Botanical Garden (http://www.missouribotanicalgarden.org/PlantFinder/PlantFinderDetails.aspx?kempercode=d553) seems like they do best in acidic, consistently moist-to-wet soils, whereas I have circumneutral soil that fluctuates between wet and baked dry. If you have some soil that approximates the inkberry's ideal conditions, perhaps it would do better for you? I'd suggest one of the named cultivars (maybe Brodie). I've found eastern redcedar (J. virginiana) to be a hella tough plant. The only problem mine have is bagworms, for which I spray once a year (if I see them on a plant) with Bt. Also, I think J. virginiana would like at least partial sun (full sun is better). Ilex opaca is another native evergreen on the same list. If you can deal with a deciduous shrub (that tends to hold onto its leaves fairly late into autumn), I'd also recommend Viburnum dentatum (arrowwood viburnum). Although depending on where you live and garden, I understand that viburnum leaf beetles can be a problem in certain northern climates. A quick update from Johnson City, TN. My 2 Myrica cerifera 'Hiawassee' wax Myrtles are doing great and were not affected at all by the 8 degree night we had when my pipes froze :(. I'm concerned they may grow up fast to 20 feet. So they will likely need to be cut back. I wanted one other fast growing evergreen to screen out the neighbor behind me. So I put in an Elaeagnus x Ebbingei as this was not on the Tennessee list of Invasive Species like its parent Elaeagnus pungens. It was only later that I found out that the fruits do not come true from seed and that it could have Eleagnus pungens-like progeny and be just as invasive. Luckily I only bought one and the species is dioecious. So there shouldn't be any fruit unless one of my neighbors also buys an Elaeagnus. I put in Juniperus Virginiana 'Grey Owl' and Juniperus Virginiana 'Glauca Compacta' (supposed to be 10' tall by 5' wide) Eastern Red Cedars (from Beaver Creek Nursery in Knoxville). I'm looking to replace the invasive Callery Pear ( I can't believe developers are still using these) in my front yard in full sun that came with the house with a native small flowering tree with berries for wildlife. I was thinking about getting a native crab apple, hawthorn, or serviceberry. But all of these suffer from Cedar rust fungal disease with the cedars near my house. I want a tree that grows moderately quickly. So that rules out Flowering Dogwood, Black Haw Viburnum, Southern Rusty Black Haw Viburnum, and native Fringe tree. So I might not be able to find a native that both fruits and has showy flowers that will grow well in my red clay soil. Aralia Spinosa (Hercules Club) might be interesting to try if my kids and I can avoid the thorns. Foster's Holly might be a safer choice. Carolina buckthorn and Amorpha fruticosa would be better in hedges I think. 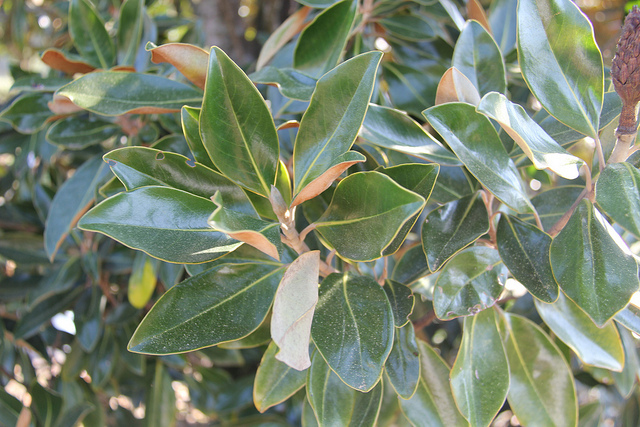 Magnolia virginiana (Sweet Bay) and Osmanthus americanus are semi-evergreen options. A non-suckering native elderberry cultivar may be a top choice. I don't yet know the soil pH. I think I will first try the flowering Oxydendrum arboreum sourwood tree that likes acid soil. It's got nice fall color. If it languishes or dies, I think I will get a large Nyssa 'sylvativa' Black Gum tree as I have the room for one big tree and it's got red fall foliage. Although its dioecious like Osmanthus, I read that it might get a few berries without another tree around and the bees love the tiny spring flowers. But I was hoping to get an Illinois Everbearing Mulberry tree for the birds (and for me) to munch on. But the neighbors wouldn't be so thrilled about the mess. For the evergreen hedge, The Yaupon Holly cultivar 'Hoskin Shadow' also called 'Shadow's female' is claimed to be hardy in zone 6 on one website. There are also several varieties of Ilex Glabra Inkberry Holly that don't get very 'leggy' that might be worth a try if you ever needed a low hedge 2-8 feet such as 'Shamrock', ‘Nigra’, ‘Ivory Queen’, Nordic, ‘Nova Scotia’ and ‘UGA’. Thanks for your detailed comment on your success with various privacy/screening plants and your thoughts about certain plants you'd like to try. 1) I've had good luck with straight species wax myrtles (Myrica cerifera) of southern provenance (Georgia and Florida). The Georgia one in particular made it through some sub-zero temps a couple years back when it was a young transplant. It did go deciduous in those circumstances, but leafed out again in the spring. I suspect your Hiawassee will be just fine with whatever Knoxville throws its way. 2) I hope to get to Beaver Creek this spring to get a couple of plants. I've never shopped with them before. Have you had good luck with the plants you bought from them? I've found Grey Owl to be a very nice J. virginiana cultivar, though of course it's more of a groundcover than a screening plant (though I think very old plants could eventually grow up to 10 feet tall). 3) In my experience, crabapple does get cedar rust pretty bad if you have eastern red cedars nearby. I've heard from a friendly fellow blogger in Alabama that serviceberry is much less affected by the rust, so you might want to reconsider using Amelanchier arborea. 4) I've had good luck so far with a couple of Magnolia virginiana plants. Neither has been particularly fast-growing yet, but I think they're still getting established and have high hopes that they'll start picking up speed in the next year or two. On the other hand, I ended up tearing out my own Osmanthus americanus. It never really grew at all over a few seasons and it seemed susceptible to attack by deer who would bite it back while ignoring other nearby plants. 5) I'm growing a straight species Yaupon holly that is doing well so far this winter (I think the low temp here so far is only 9 degrees though). Again, it's still getting established. This is its first winter and I hope it will grow by leaps and bounds soon. 6) I had no success with Ilex glabra. I had one of the cultivars - maybe Nigra? I had the problems with legginess and several of the shrubs had major dieback (leaves would turn black and fall off, entire branches would die). A third shrub did a little better after being transplanted to a full sun spot, but it never thrived or grew an inch. I eventually shovel-pruned it as well. Moreover, I don't think I've ever seen an impressive Ilex glabra hedge here. Maybe it does better in its native habitat along the coastal plain? Good luck and keep me posted on how your plans evolve and your garden takes shape! My viburnum dentatum var. scabrellum (aka viburnum ashei) had tons of flowers this June but didn't produce any berries although the Classic Viburnums website described it to be self-fertile. Do you know if it needs 2 separate plants to get berries. I’ve never read of any other Viburnum dentatum cultivars that bloom as late as V. dentatum scabrellum that would be a possible pollinator. It blooms 3 weeks after my V. dentatum Autumn Jazz and 4 weeks after my V. dentatum Blue Muffin cultivars. Maybe it just needs one more year to mature before it produces berries. I'm not sure whether or not to order another one from Classic Viburnums. I just bought a Viburnum dentatum ‘Little Joe’ from Beaver Creek nursery in Knoxville to better pollinate the Blue Muffin cultivar. The mockingbirds have been appreciative of the few berries produced on my arrowwood viburnums and red and yellow-twig dogwood shrubs. I have limited space and have got my eye on several other native plants from the large selection available from Overhill Gardens in Vanore, TN including V. bracteatum ‘Emerald Luster’ and V. dentatatum ‘deamii’ to if their flowering matches up to pollinate the V. dentatum ‘Autumn Jazz’. I just found out that Overhill Gardens can deliver to Knoxville for a $25 fee. I’m also thinking about getting a native bush honeysuckle hybrid (Diervilla x splendens), dwarf buttonbush (Cephalanthus ‘Sugar Shack’), and climbing aster (to climb up my wax myrtle ‘Hiawassee’) for the pollinators. To add a little color to the yard I've added 4 different dwarf purple and gold ninebark (Physocarpus) cultivars (Little Devil, Tiny Wine, Tiny Wine Gold, and Lemon Candy), but the Lemon Candy's leaves are larger than the rest, so I suspect it will not stay as small as the others. I also just added 3 different native Hypericums (St. John's worts) H. densiflorum, H. prolificum, and H. frondosum 'Sunburst' that along with new Diervilla sessifolia ‘Cool Splash’ and Diervilla rivularis ‘Troja Black’ kept the bees busy this summer. I’m lucky. Carolina Native nursery is only 50 miles from my house, so I didn't need to order the native plants online. Truth be told, I wasn't so keen on the var. scabrellum arrowwood, so I shovel-pruned it. I don't think I ever saw berries on it while it was in the garden. Actually, I have 6 or 7 arrowwoods, but the only ones that reliably produce berries so far are the Chicago Lustre and the straight species. Interestingly, the Chicago Lustre berries are already ripened and mostly gone (several mockingbirds were feasting in the shrub for days), while the straight species berries have not ripened yet at all. I have Autumn Jazz, Crimson Tide, Deam's variety and two seedlings, but none of those have berried yet and they haven't actually flowered all that much either, although they all seem to be growing well. I think they just will need more time to mature. You're lucky to have so many native nurseries nearby! I hope to get over to the Knoxville area this fall and explore some of the nurseries you mentioned. Like you, I'd like to add a buttonbush (though the straight species) and a Diervilla (also the straight species - D. sessilifolia). I tried a Diablo ninebark a couple years ago, but it turned out to be a favorite snack of the deer, so I got rid of it after seeing it get chomped back again and again. I think you'll really like H. frondosum 'Sunburst'. Some of the best early summer flowers that attract *loads* of bumblebees, although I'll be interested to hear how it does for you in the long-term as mine have had a tendency to be short-lived (3-5 years). I think H. densiflorum and H. prolificum seem more reliable, but I haven't been wowed by either from an aesthetic standpoint. It's great to hear that the Diervillas are big bee attractors. I haven't tried any yet, but like I said, hope to add one or two to the garden this fall. The biggest bee attractor in my garden right now? It's the (self-seeding) annual wildflower partridge pea (Chamaecrista fasciculata)!